country kitchen, large verandahs, two open fires and a modern bathroom plus a second toilet. countryside surrounding the village of Berry. It has amazing views to the escarpment and also views over rolling hills to the ocean. It has a lovely waterfall on the property. The cottage is very private as we have 150 acres so no close neighbours. of Berry and 2 hours from Sydney. We also live on the property so are always available to answer any local questions and help with advise on restaurants etc. We love this property because of the peace and quiet also the proximity to Berry. The view is to die for. The farmhouse was absolutley beautiful. Every room was so comfortable and very well equipped. We really enjoyed the extra touches like Christmas decorations, which made our stay magical. We'll be back. We really love to hear people enjoy our little country retreat and always look forward to their return. Beautiful country side straight out of a scene from Thomas the tank engine. 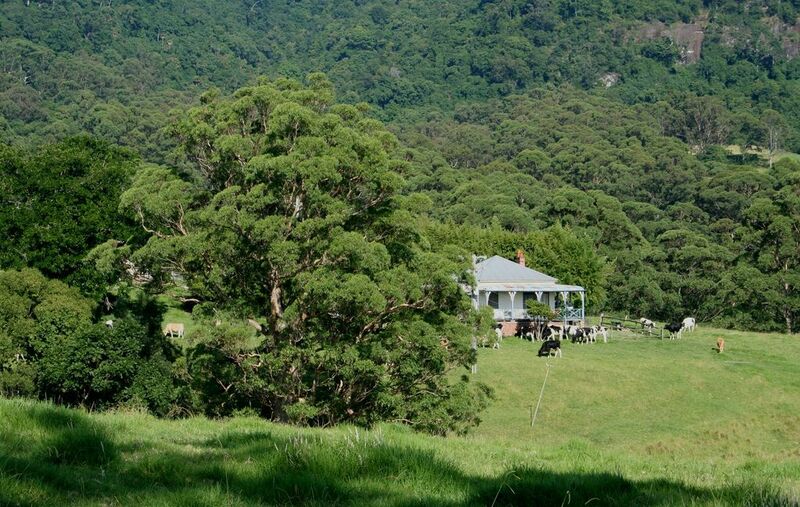 Rolling green hills, lush country side nestled under Berry Mountain, big beautiful iconic trees, classic & diverse bird life, friendly cows that greet you in the mornings, scurrying wombats (they are quicker than you think!) & a very cute cottage. The hammock on the wrap around balcony made for a very restful stay & kept the kids occupied. Very tasteful & comfortable accommodation. Basic kitchen with no dishwasher or other mod cons & not a condiment sight, including no tomato sauce or cooking oil, which was unusual. No Wi Fi either but phone reception is good & I'm with Vodafone!!! Berry village is a short drive away & it gets better & better every time we visit, Sydney quality bakeries, deli & wine shop etc.... We'll be back. Scott so glad you enjoyed your country break at our cottage. So sorry about no tomato sauce etc but we have found most people prefer to bring their own choices. We had an amazing time at the cottage- tastefuly decorated, with a fireplace and spectacular veranda with stunning views. The only negative is that we had to leave. Thank you! Amazing charming, cosy and quiet place to escape the craziness of the city. We already stayed twice at Jasper Cottage and here are the resaons why! Everything is made to make you feel at home: the nice chocolates and bottle when you arrive of course but also the hamac on the balcony, the fire all prepared so you just have to light the match, the comfy beds, the very tasty decoration and paintings on the walls... The all environment is making the place perfectly bucolic with the cows surrounding the property, the big variety of birds. If you're lucky you might see a wombat passing by... This little "coin de paradis" viewing soft and green hills reminded the all family a bit of Grandma and Grandpa's house back in France, in south of Burgundy. Thank you! Absolute Serenity - vintage bliss! The beds were so comfortable! Which is a big call from me as I usually wake up with stiffness whilst on holiday as nothing compares to my bed at home. So comfort is definitely to be found here! The location is SO good, only 5 minutes from the town centre, but secluded enough for you to gain peace and relaxation. And oh my goodness the views!!! The pictures just don’t it justice. Rolling hills, spotted cows, you’re surrounded by gorgeous nature. There were plenty of appliances and cutlery, the kitchen was very very well stocked. The only thing I could think of for an improvement would be flyscreens on the bedroom windows, when we needed to air out the room from an obvious recent paint job, we had a lot of bugs/flies come into the kids bedroom and they weren’t too happy to sleep with them. The outdoor entertaining area with bbq and seating was just superb! You felt like you were eating dinner in a paddock. One morning we woke up to a herd of cows surrounding the cottage, the kids absolutely loved this! If you want to connect with nature in comfort and have a true country experience, whilst relaxing, this is the place for you! Highly recommended. It was awesome. It was our second time. I am sure there will be few more. Feels just like home. And pam!!! She is a star. Rony thank you so much. It was lovely you could bring your cousin here. Hope to see you again sometime at Jasper Cottage.